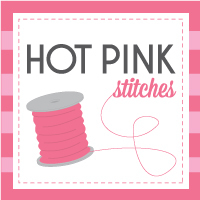 Hot Pink Stitches: Sewing Room Redo: the Big Reveal! 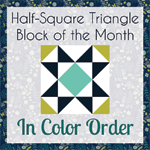 Sewing Room Redo: the Big Reveal! Here it is, the big reveal! Hopefully after looking at all the beautiful spaces I've featured all week mine won't pale in comparison. I had some family visit recently, so that was the true motivation behind the reorganization. In true "gung ho" form, I was up to my knees in bins and supplies before I thought to take a before picture--I'm so crazy that I almost put everything back in its previously messy state just to take a picture! But I trudged forward and have ended up with a well-organized room that makes me smile. I hope you enjoy the tour! Here we are at the doorway. It's just down the hall from our bedroom, so it's conveniently located and I'm never too far away from the hubs. This is the right-side wall. 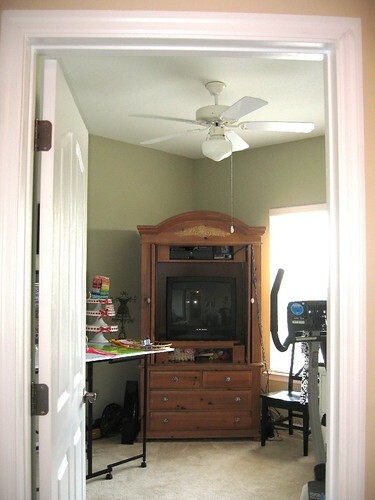 I have the stationary bike in there, since I exercise and watch tv on it at night. 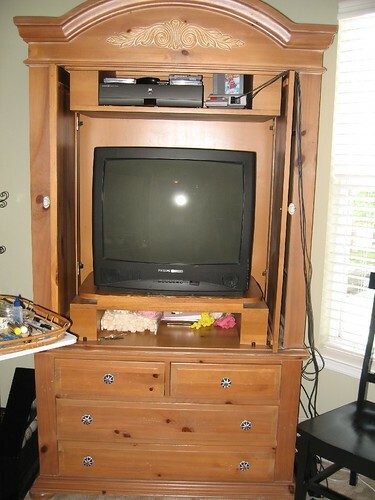 Moving to the left, we find the armoire and cutting table. Here is the cutting table on its own. I bought it at the JoAnn's Black Friday sale last year and I will say that my visits to the chiropractor have definitely gone way down! Working at the proper height is a real back-saver. The sports pictures can be explained by simply telling you that I put them up for my husband. Although the room is very technically 95% girly sewing stuff, the pictures on the wall allow me room in the argument that I took over an entire room and that he has nothing in the whole house that is his. It is my saving grace in that once-in-a-blue-moon "discussion." 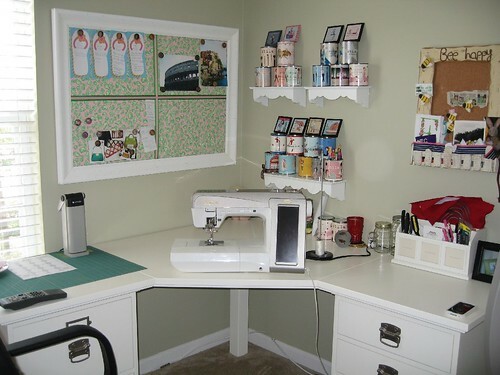 I'll put up a supply pegboard and some cute sewing prints in the next house. 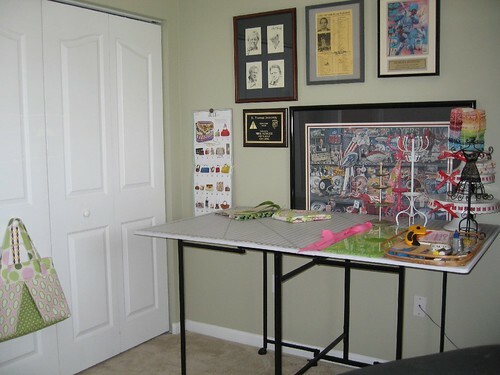 This is my sewing corner where I end up spending most of my time once things are prepped. I've decorated it super girly, so I love looking at it whenever I'm over there. This is my Stila paint can/palette collection. I started wearing Stila makeup in college and began collecting these. 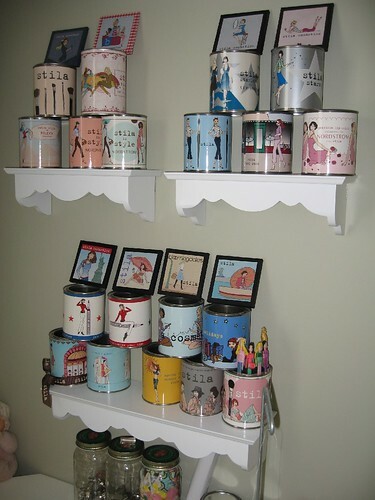 Each can is from a different store opening or is a special edition for an event or holiday. I even have a few things up there acquired from limited edition Australian & Japanese releases. I got them all by either buying my makeup or swapping with other collectors. 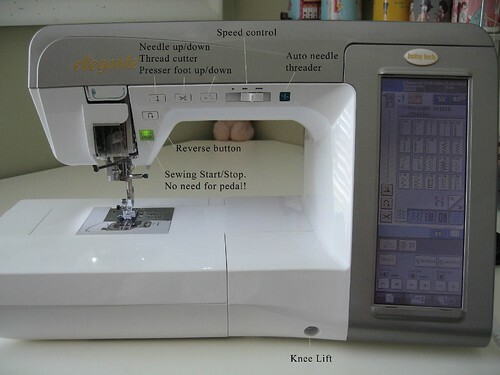 I am now officially spoiled and could never again live without the automatic thread-cutting button, among other things. Where it all happens! 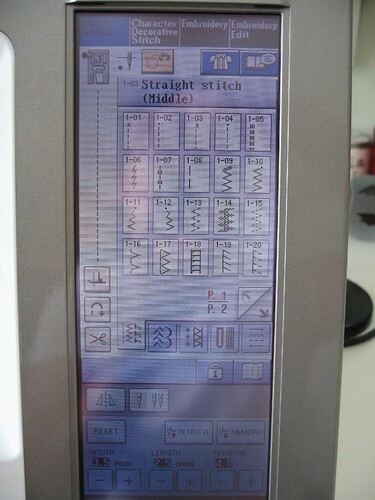 All my options tucked into pages and pages of touch-screen buttons. 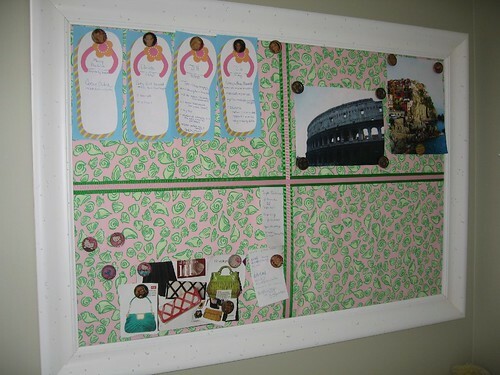 My bulletin board that I made myself. I ripped up an old Lilly Pulitzer euro sham, wrapped it around foam board, added the layered ribbons, inserted into loose white-washed frame, backed with pressed wood, and voila! I have my orders on the top, with inspiration photos and pretty views elsewhere. I've gotta have some background noise, so trashy reality tv is usually playing while I work. This is my labor of love! I desperately needed to reorganize and categorize. I had way too many fabric cuts, notions, and more that were lost in corners and therefore useless. Anyone else have that problem? I put my everyday fabrics in bins, but so I could see them. If I need to take any of them with me, I just grab the bin and go. Easy peasy. I bought a few more bins and lots of drawers, and labelled everything. 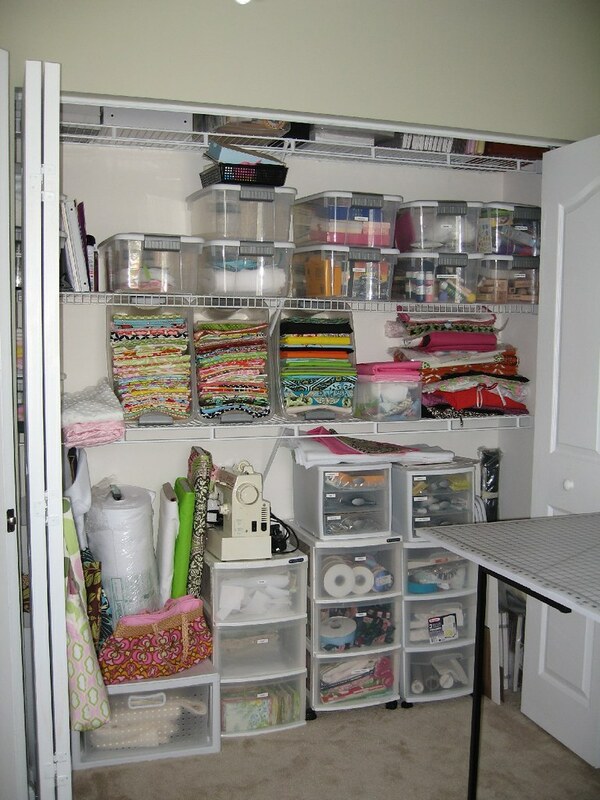 I have stash drawers, "special" stash drawers, notions and supplies, scrap drawers and more. Organization abounds! Click through to the Flickr pic to see all the notes and find out which bin is which. Another view, peeking into the corner of the closet. Thanks for stopping by and for taking the tour of my big sewing room redo! Leave a comment so I know you were here and let me know what you think. What are your favorite organization tips? Hi! 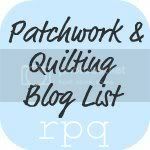 I found your blog by googling for sewing rooms. I love your sewing table - did you make it or was it purchased? It is exactly what I'm looking for. I do have a tip for you. I wrap my smaller cuts of fabric around comic book boards. Then they sit in my bookcase upright. I found your room tonight via the "Where I Sew" mosaic. 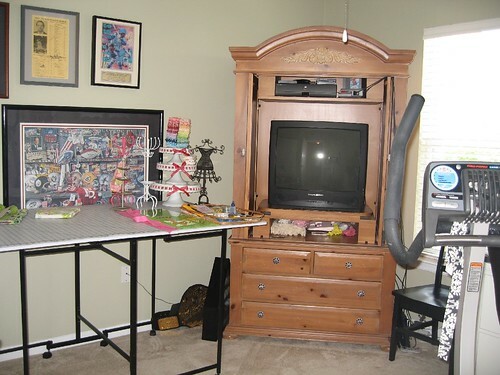 I like your "Super Girly" Sewing Corner. It looks to be a bright, happy, creative space. Thanks for sharing and I hope you still love your space. 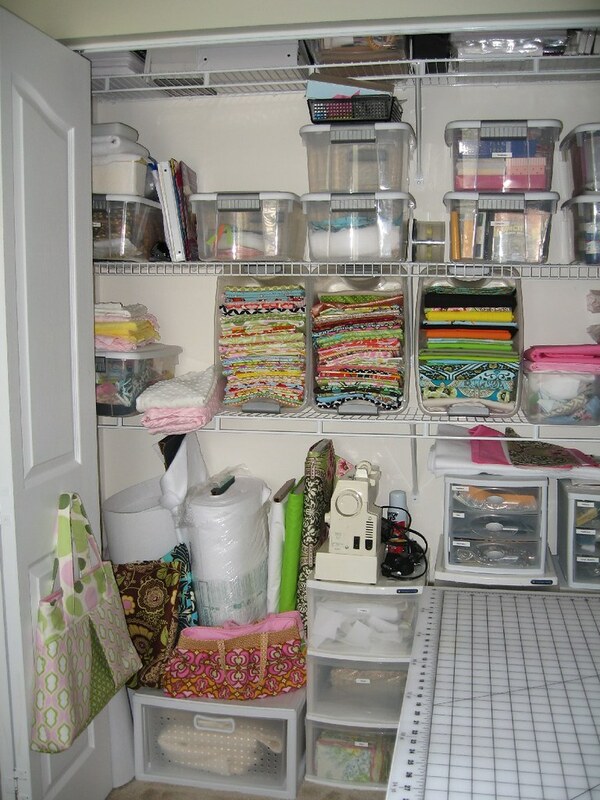 I love your sewing room. I have a small room that I am trying to organize. I think I have too much "stuff". But you gave me some great ideas! 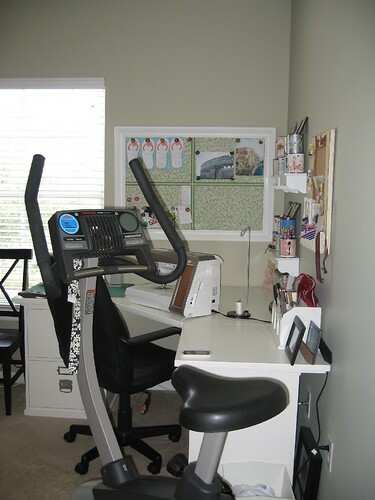 I do like your sewing room. I am busy with my sewing room at this moment and try to find some ideas on the internet. Subscribe For 5 Star verified winning bets on MLB, NHL, NBA and NFL + Anti-Vegas Smart Money Signals!! !